Agriturismo Il Poggiarello has been created from the restoration of the most ancient builduing of the Property and offers 10 apartments furnished in typical tuscan style and equipped with a kitchen corner. It's possible to ask for the B&B treatment as well. The farmhouse has a little restaurant open twice a week where guests can enjoy the typical tuscan cuisine, simple but tasty. During the summer the dinner is served on the terrace, which offers a wonderful view on the vineyards of the Property. Relax, nature and warm hospitality: these are the ingredients for a holiday in our farmhouse. 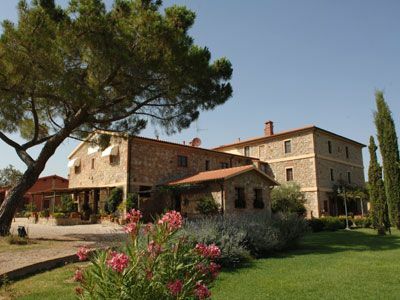 Il Poggiarello is located on a plain surrounded by vineyards and hills covered by the olive groves and the woods typical of the tuscan Maremma. With a 360° panorama guests can have a view on 6 villages. The strategical location between Siena and Grosseto makes it a ideal starting point for a gastronomical tour, for art itineraries or to reach the beach of Castiglione della Pescaia. In Roccastrada there are all kind of shops and services. There are also a supermarket and some restaurants. Roccastrada, 7 km from the farmhouse. The farmhouse is closed from the 3rd of November to the 21st of March.